September 13 — St. John Chrysostom, Bishop and Doctor of the Church - Memorial - My Catholic Life! In the tug and pull of the theological disputes of the fourth and fifth centuries, today’s saint was a seminal figure. Along with other luminaries such as Saints Ambrose, Athanasius, Hilary, Basil and many others, he tunneled deep into Scripture and the existing Christian tradition to carve out what today we call the deposit of faith. 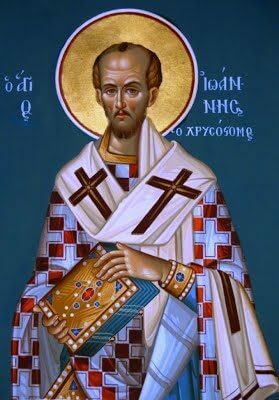 Saint John Chrysostom was from Antioch, that “Metropolis of heresy” in Blessed Cardinal Newman’s words, where Arianism was bred, incubated, lived, and died in the period between the Council of Nicea in 325 and the Council of Constantinople in 381. John received an excellent education in the liberal arts and was baptized at the age of eighteen, in keeping with the custom of adult baptism common to his era. He joined a rustic group of hermits in the hills outside of his hometown in his mid-twenties. The conditions were so physically and psychologically brutal, though, that he left after seven years. Living always isolated and mortified would not be his path. He was ordained a priest in 386. His bishop recognized his gifts and put him in charge of the physical and pastoral care of the poor of Antioch, while he also honed his natural gifts as a preacher. He was so skillful in preaching that a century after his death he was given the title of chrysostom, or “golden mouth.” John’s theological acumen was no less impressive. His sermons and letters display a refined understanding of the intricacies of the Holy Trinity and of the Gospels. His beautiful theological and spiritual reflections are referenced numerous times in the modern Catechism of the Catholic Church. In 398 he was consecrated the Archbishop of the New Rome, Constantinople, provoking jealousy among some contemporaries. John did himself no favors by his over aggressive reforms as Archbishop. He bluntly criticized women for wearing make-up, Christians for attending races and games on holy days, the imperial court for its extravagances, and the clergy for their laxity and wealth seeking. Recriminations soon followed. He was falsely charged with treason and other crimes and was exiled in 402. He was reinstated after an earthquake in Constantinople was understood as divine punishment for his banishment. But he was exiled a second time shortly thereafter. Like other saints, his time of exile proved fruitful, as he wrote numerous letters, specifically to bishops in the Western Empire, including the pope. But also like other exiled popes and bishops, assertions of support were only as sturdy as the paper on which they were written. Practical help never arrived. John died in 407, still in exile, due to cold, rain, a forced march and lack of food. Within a decade after his death, his reputation was restored by the pope, and his remains were transferred for burial in Constantinople. He was recognized as a Father of the Church at the the Council of Chalcedon in 451 and declared a Doctor of the Church in 1568. Saint John suffered for his zeal. He was exiled by civil power in an age when correct theology was understood as a form of patriotism, and error as treason. He crossed the civil powers of his age, did not back down, and paid a severe price for his fidelity. Western Crusaders stole his relics when they sacked Constantinople in 1204 and brought them back to Rome. In 2004 Pope Saint John Paul II authorized the return of some of his remains to Istanbul’s Saint George Church, the seat of the Orthodox Patriarch. Saint John Chrysostom, the heat of your words burned so hot that you were persecuted for your ardor. Inspire all Christian preachers to light a fire of faith in their congregations, without fear for their own reputations or of recrimination.